The Buffalo Bills, winners of two consecutive American Football League championships, were looking to make it three as they faced the Kansas City Chiefs on January 1, 1967. In this first season since the merger between the NFL and AFL was announced in June of 1966, a further honor would go to the game’s winner, as the champions of the two leagues were to meet for the first time in what was already being unofficially referred to as a “Super Bowl”. The Bills had won titles in 1964 and ’65 with Lou Saban as head coach, but he had departed and been replaced by Joel Collier for 1966. QB Jack Kemp struggled with a sore arm, but was still an outstanding leader and field general, and the club ran the ball effectively with Rookie of the Year HB Bobby Burnett and FB Wray Carlton. The defense continued to be the team’s bedrock and allowed the fewest points in the AFL. Buffalo topped the Eastern Division with a 9-4-1 record, just beating out the Patriots. 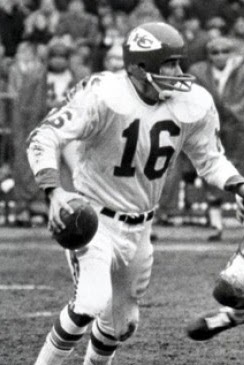 Kansas City, coached by the innovative Hank Stram, had a fine veteran quarterback in Len Dawson (pictured above) and had also benefited from the addition of a talented rookie in the backfield, HB Mike Garrett, the Heisman Trophy winner out of USC. Otis Taylor emerged as an excellent flanker in his second year. The defense contained all-league performers in DE Jerry Mays, DT Buck Buchanon, LB Bobby Bell, and FS Johnny Robinson. The Chiefs placed first in the Western Division at 11-2-1. There were 42,080 fans in attendance at War Memorial Stadium on a cold and wet day in Buffalo. 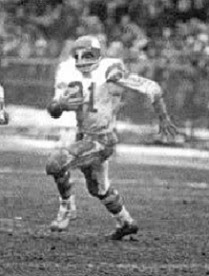 Bills DT Dudley Meredith fumbled the short opening kickoff, giving the Chiefs the ball at the Buffalo 29. Three plays later, Kansas City gained the initial advantage when Len Dawson passed to TE Fred Arbanas for a 29-yard touchdown. 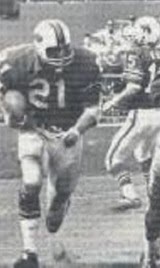 Buffalo struck back quickly, however, with Jack Kemp throwing to flanker Elbert Dubenion (pictured at left) for a 69-yard TD. Booth Lusteg’s extra point tied the score at 7-7. The Bills blitzed Dawson heavily, and the KC quarterback was forced to audible often as the game settled into a defensive battle. 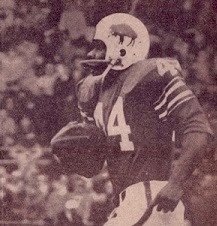 Early in the second quarter, Mike Garrett returned a punt to the Buffalo 45 and, following a couple of runs plus a toss to Arbanas (who was knocked out of the game with a shoulder separation on the play), Dawson fired off a pass just before being hit by LB Harry Jacobs that Otis Taylor caught for a 29-yard touchdown. Mike Mercer added his second PAT of the game and the Chiefs were back up by seven points in the second quarter. On Kansas City’s next series, the Bills missed an opportunity when CB Tom Janik failed to intercept a poorly thrown Dawson pass with open field in front of him at the KC 21. The score remained 14-7 in favor of the visitors. A key turn of events occurred with time running down in the half. Kemp completed two passes to Bobby Burnett that picked up 50 yards to the KC 12, and seemed to be on the verge of evening the score once again. But two plays later, Kemp’s throw into the end zone intended for split end Bobby Crockett was intercepted by Johnny Robinson, who returned it 72 yards to the Buffalo 28. Mercer kicked a 32-yard field goal with three seconds left on the clock and, instead of the game potentially being tied, the Chiefs went into halftime with a 17-7 lead. The contest had been competitive in the first half, but the Chiefs took control in the second half, utilizing their running game effectively. Kansas City used the I-formation to good effect, with Mike Garrett (pictured at right) and FB Curtis McClinton lining up directly behind Dawson and not shifting until just before the snap. The third quarter was scoreless as both defenses asserted themselves, with the Chiefs putting particularly heavy pressure on Kemp. Heading into the fourth quarter, the Chiefs took possession at their 37 and drove 63 yards in seven plays, the biggest one a Dawson throw to split end Chris Burford for 45 yards to the Buffalo four. Garrett plunged for the final yard and the visitors extended their lead to 24-7 with nine minutes remaining. Buffalo mounted a drive in response but SS Bobby Hunt recovered a fumble by end Glenn Bass, who was hit hard by CB Fred “The Hammer” Williamson, and returned it to the Bills’ 21. Three plays later, Garrett took a handoff, reversed field twice, and broke away for an 18-yard touchdown that clinched the game for the Chiefs. The Bills fought back, but continued to come up empty. Kemp’s last pass of the game was picked off by DB Emmitt Thomas and Kansas City won by a final score of 31-7. The Chiefs had the edge in total yards (277 to 255) and first downs (14 to 9) in what was largely a defensive struggle. Buffalo recorded nine sacks, to four by Kansas City, but the Bills turned the ball over four times, to none by KC. Len Dawson completed 16 of 24 passes for 227 yards and two touchdowns with no interceptions, and ran the ball five times for 28 yards. Otis Taylor had 5 catches for 78 yards and a TD and Chris Burford contributed 76 yards on his four receptions. Mike Garrett rushed for 39 yards on 13 carries that included the two fourth quarter touchdowns and also caught four passes for 16 yards. Curtis McClinton added 38 yards on 11 rushing attempts. For the Bills, Jack Kemp was successful on 12 of 27 throws for 253 yards and a TD while giving up two interceptions. Wray Carlton ran for 31 yards on 9 carries and while Bobby Burnett (pictured at left) gained only six yards on three running attempts, he caught 6 passes for 127 yards. Elbert Dubenion, with the long early TD, had 79 yards on his two pass receptions. “Our game plan was to throw first and run second, and we used 10 to 12 formations off the I,” explained Coach Hank Stram. Two weeks later, the Chiefs met the NFL Champion Green Bay Packers in what was officially dubbed the AFL-NFL World Championship Game, but would retroactively be called Super Bowl I. Kansas City kept it close for a half before the Packers asserted their dominance and won by a 35-10 score. The Chiefs dropped to second place in the Western Division with a 9-5 record in 1967, but tied for first in ’68 and won the last AFL title (as well as Super Bowl IV) in 1969. The loss in the AFL Championship game marked the end of an era for Buffalo. The Bills, despite efforts to retool the roster through trades, dropped to 4-10 in ’67. They would not post another winning record until 1973 and next appeared in a postseason game in ’74.